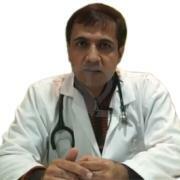 Dr. Sanjeev Bhatia MBBS, MS (General Surgery), is a Senior Consultant - General Surgery at Mukat Hospital, Chandigarh. Prior to joining Mukat Hospital, he has been associated with Government Medical College, Sector 32, Chandigarh. Dr. Sanjeev completed his basic medical studies (MBBS) from Pune University and MS (General Surgery) from BVPD University. He had done a fellowship in minimal access surgery (FMAS) at AIIMS, Delhi. and fellow observership in Diabetic foot surgery at AIIMS, Kochi. Dr. Sanjeev has been associated with several prestigious institutes such as, Jahangir Multispecialty hospital , Apollo group of hospital, Pune, Max Superspeciality Hospital, Mohali. He is specialized in Advanced Laproscopic and endoscopic surgery. Besides, he has rich experience in Pediatric surgery and venous disorders management. All cancer surgeries of Thyroid/Breast/Bowel/Abdomen/Chest etc. To his credits, he has been awarded by the Young Surgeon Award by editor of Love & Bailey. Besides this, he has contributed his research work specially in the domain of Diabetic Foot to various peer- reviewed journals.